A good recruitment process is a cornerstone of any successful organization as a right fit employee will not only be more productive but will also have a desire to stay for a longer period. The job market nowadays is candidate driven and therefore it’s imperative for the HR team to hire the most talented people. This can only happen if the recruiter has a tool to skim the candidates to find the right fit and immediately start building a relationship. With time, the hiring volume is predicted to increase manifold but the volume of recruiting teams keeps shrinking or is disproportionate to the task involved with talent acquisition. The data based KPI’s, expected from the recruitment manager includes time to fill and the quality of hire has put extra pressure on the recruitment team. With the deluge of recruitment activities growing by the day and where a timely hire is of the essence, HR recruitment teams around the world have leveraged the automation capabilities of Information technology to reduce the bulky and repetitive task. The automation in recruitment utilizes the omnipresent “BIG DATA” and compiles a comprehensive and unbiased picture of the prospective candidate. There is a big paradigm shift in the way the recruitment automation tools are changing the recruitment process and in turn arming the recruiter with preemptive decision-making platform. The following are the salient features of recruitment automation which facilitate in recruiting the best talent from the pool of prospective candidates. The intelligent screening software powered by AI (Artificial Intelligence) automates the tedious resume screening process. It’s been designed in such a way that it learns the job requirement and based on past recruitment ascertains the previous hiring decisions. The AI screens the resume on important keywords according to the job requirements and picks the most suitable from the applicant pool. The tool grades and rank candidates based on knowledge gained from the employee’s experience, qualifications, and social networking sites. This reduces time to hire by automating repetitive task and allow the recruiters to engage with candidates and understand how culturally fit they would be within the organization. The turnover of the employees has been a bane of any organization’s existence. Quality of hire has been one of the major reasons behind the churn. The recruitment automation tools standardize job matching by analyzing the large HR data collected over years and providing a predictive analysis report, thereby reducing the cost associated per candidate screening and revenue per employee. Sometimes the recruitment process is marred by human biases, even though it might be unconsciously done, but the flow-on-effect could lead to dire consequences, resulting in a large number of under skill misfits. AI powered recruitment tools can be programmed to unlearn clear patterns of potential biases. The current market is a candidate-driven market and it’s important to hold on to your top candidates. The first impression is quite important when you are building a relationship. The recruitment automation like chatbots allows real time updates by asking pre-qualifying questions throughout the application process. The regular feedback, updates and next step suggestions provide a great experience for the candidates, in turn showcasing an organization in good light. 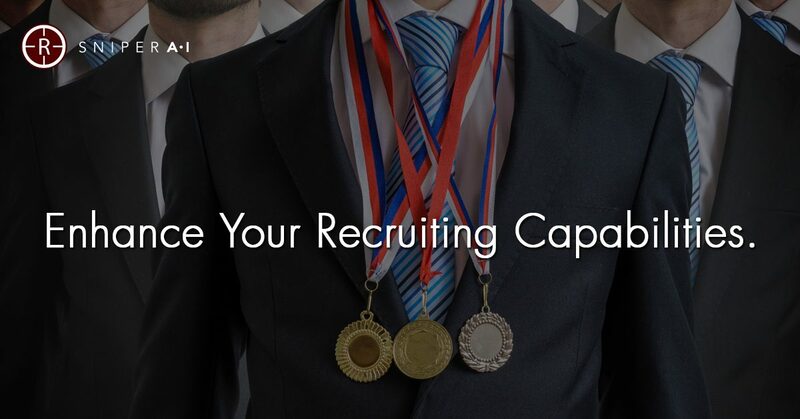 There is a competition for talent in the job market and every recruiter is trying to out run the other in securing the right candidate for the job. A good recruitment tool like SniperAI will allow the recruiters to focus more on “human” work like candidate engagement than focusing on the laborious and time-consuming exercise of resume screening, resulting in proactive hiring and workplace planning.